A comforting, warm and flavorful twist on classic enchiladas. 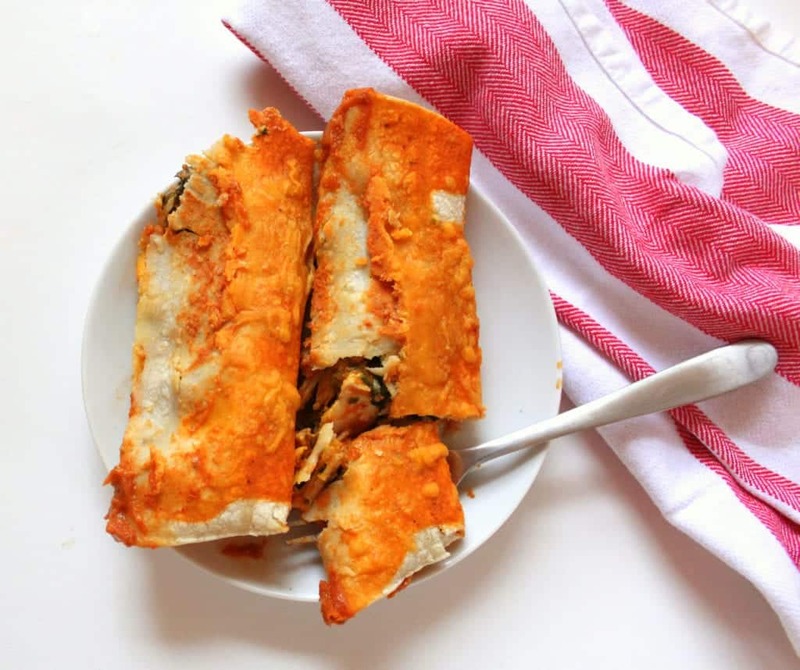 Low FODMAP Enchiladas use a homemade sauce combined with pumpkin and spinach for a flavor and nutrient boost! Of course, I have my go-to meals that don’t require much thinking (roasted chicken and vegetables, a bowl full of roasted vegetables brown rice and whatever protein we have on hand such as lentils, chickpeas, chicken or fish, build your own taco/nacho/burrito bowl bar) and we eat like that a couple of nights a week. 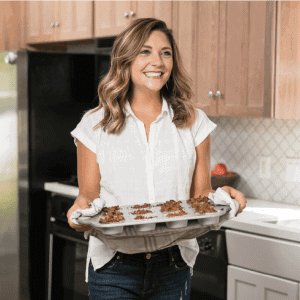 But when it comes to recipes that I develop (aside from the testing process), try from a cookbook, or learn from a family member or friend…I rarely repeat! 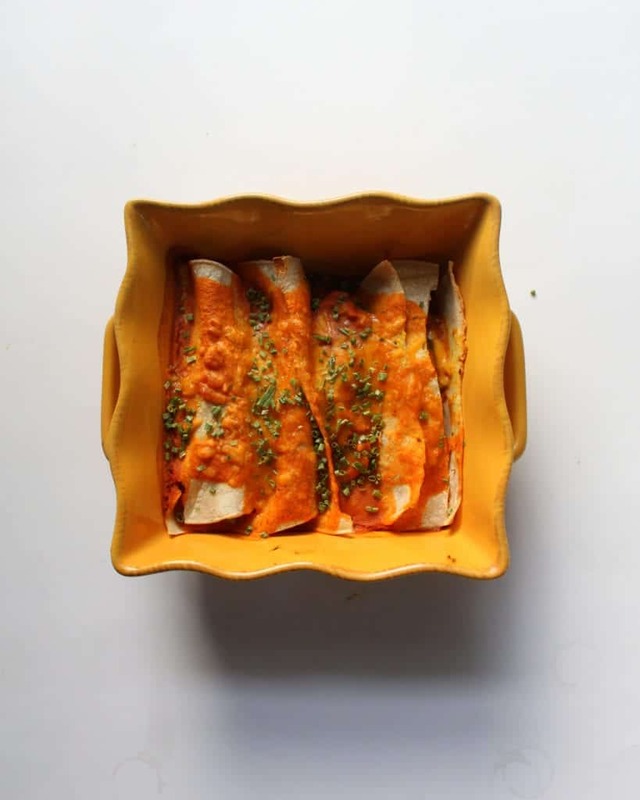 This recipe for Low FODMAP Enchiladas is one that Brian has requested I repeat every. single. week. It does require a bit of juggling in the kitchen because it calls for a homemade low FODMAP enchilada sauce (to die for!) and shredded chicken, but with a little pre-planning you can whip this ultra FLAVORFUL and satisfying meal together any weeknight. I don’t know what inspired this recipe aside from the fact that Brian and I both really enjoy Mexican-style cuisine and I had a hankering for these flavors. 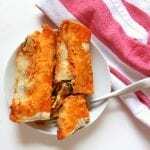 I recalled a recipe for Pumpkin Enchiladas I made from the Hungry Girl way back when I was in college, and I had a partial can in the fridge that I needed to use….so these low FODMAP Enchiladas (full of pumpkin AND spinach) came to life. Place your chicken breasts in the slow cooker in the morning (just chicken, nothing else!) and allow them to cook all day on low. They will be easy to shred right up when you get home from work or when you are ready to create dinner! 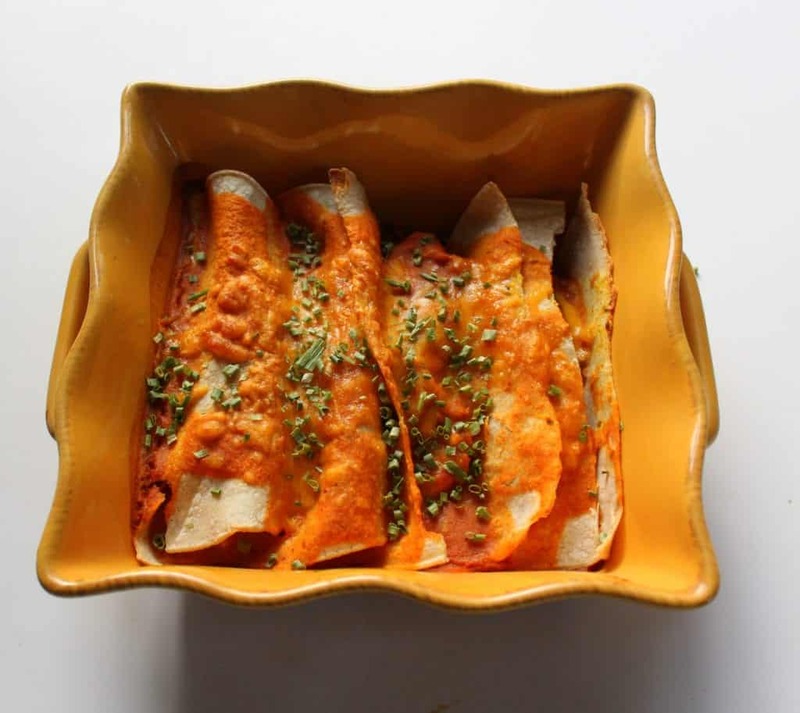 Make your enchilada sauce the day before or the weekend before to save on time the night you are wanting to enjoy these low FODMAP enchiladas. Set out all of your ingredients prior to preparing. If you do the extra planning and prep work, this recipe comes together in a BREEZE! The end result is a warm, Mexican-inspired meal that is packed with beta-carotene, vitamin K, vitamin, C, and plant-based iron from the pumpkin and the spinach! Combine all ingredients in the food processor or blender and blend until smooth and creamy. Preheat the oven to 350 degrees Fahrenheit. Spritz a 9×13 baking dish with olive oil or nonstick cooking spray. Heat the olive oil in a large skillet. Add the shredded cooked chicken, chives, green chilies, spinach, pumpkin, salt and pepper. Cook and stir for 6-8 minutes or until the spinach is wilted. 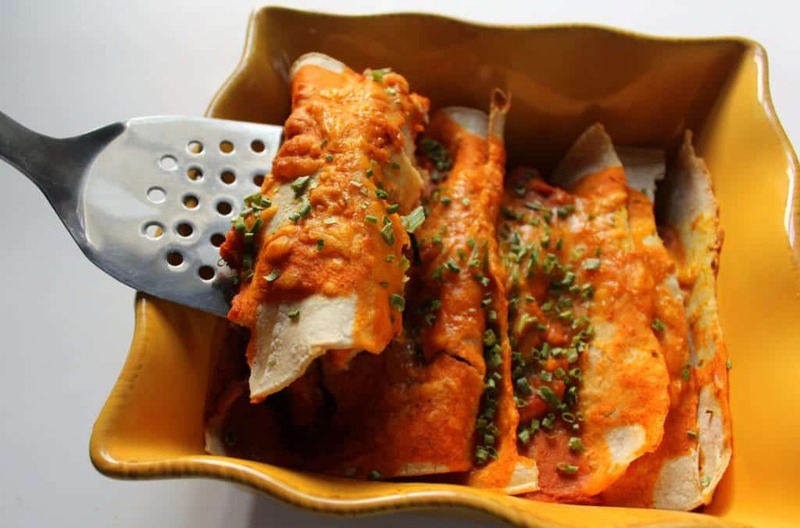 Assemble the enchiladas by placing 1 Tbsp of filling, 1 Tbsp of cheese and 1 Tbsp of sauce per roll. Place the assembled enchiladas in the prepared baking dish. Pour the remaining enchilada sauce over the top of the rolled enchiladas and sprinkle with the remaining cheese. I recommend making this enchilada sauce ahead of time to save on kitchen time and dirty dishes the night you make this dish. *Make sure broth does not contain garlic or onion if following a low FODMAP diet elimination phase. **You can use regular taco seasoning here if you are not concerned about FODMAP content. ***I recommend putting these in the slow cooker (nothing added) and cooking at low for 6-8 hours during the day prior to making this dish. You can omit and substitute with beans for a meat-free option, but I haven’t tried that yet. Feel free to experiment away! This recipe has not been tested for FODMAP content, but the ingredients are used in amounts compliant with recommendations on the Monash University app. What are some favorite recipes you repeat? YUM! I have done spinach pumpkin lasagna rollups but never enchiladas. Mexican food is my fave so definitely pinning this! I don’t think I’ve ever tried making enchiladas before, but I keep meaning to! This sounds delicious (and definitely like something I’d want to repeat over and over *-*!)! You must try!!! They are pretty dang simple once you do it…and so delish!